Corporate profits are up. Stock prices are up. So why isn't anyone hiring in America? The paradox of record-high corporate profits and extremely-high unemployment doesn't seem to be breaking anytime soon. 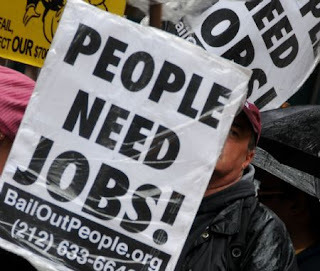 Also the longer the unemployed go without work, the greater the damage to their future employment and earnings potential as well as to our economy. How much longer can the 15.1million unemployed wait? Looking at the rash of bills introduced since January this year in Minnesota, Wisconsin and beyond, how many jobs have they created? Will voter ID laws create jobs and reduce the budget? Will the anti-union laws? Will cutting social services, education or infrastructure spending like transportation? How about more tax breaks for the wealthy and corporations? Higher fees for us? One of Scott Walker's first action as the newly elected Wisconsin Governor was to post signs along the Wisconsin/Minnesota borders, saying Wisconsin was 'open for business'. Now two months later, residents are seeing first hand how very prophet-like that single action was to their futures. Governor Walker has put the state of Wisconsin up for sell to big business at the cost of it's independence and workers souls. The question is why Walker would trade the State of Wisconsin away to thugs and thieves? My mama always said to 'connect the dots' and 'follow the money' to find the answers..easy enough to do in this instance. The Koch Brothers, an energy conglomerate involved with oil, coal, and gas contributed significant funds to Governor's Walkers election. Within 24hrs of Walker being elected, the Koch Brothers 'set up shop' in Madison, Wisconsin. 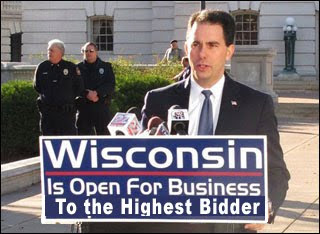 Walker pushes for the Budget Repair Bill with a provision for selling off state owned utilities with NO BID contracts! The dots lead to the Koch Brothers who have contribute billions to libertarian and tea party candidates like Wisconsin Governor Walker. They are dedicated to preserving their rights to make billions by exploiting and endangering workers while poisoning the air we breathe. In political circles their ideological network is even referred to as 'Kochtopus'. 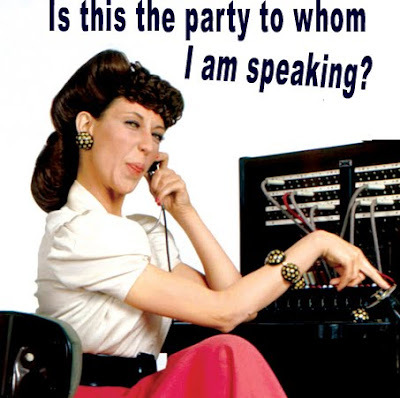 What's going on in Wisconsin is a power grab by the Brothers with their puppet Walker's assistance. If they get their way, the state of Wisconsin will become the next Koch Brother subsidiary. The Koch Brothers own Georgia Pacific products so I can stop using any GP products like Brawney paper towels...dixie cups, northern toilet paper, stainmaster carpets, mardis gras paper products, and any other related GP products. The GOP both locally and nationally continue to push bills against women, immigrants, GLBT, minorities, non-christians, the poor and unions. They've become emboldened by each others chest thumping and back slapping and see it as a mandate to pass hot-button bills against 'we the people'. In lieu of creating jobs, balancing the budget, or reducing the deficit, they are passing a plethora of bills meant to restrict and repress 'we the people' and repeal all safeguards meant to protect 'we the people' against big corporations. They have empowered the wealthy while taking our pennies. The injustice and lost of liberty makes their actions unAmerican. They have failed America. ...er..nevermind, move along nothing to see here! Minnesota has historically prided itself on a large voter turnout. Typically we have been among the top few states in the nation with a large voter turnout. In addition, voter fraud has been extremely rare (26 cases out of hundred of thousands of voters last election!). Naturally, the MN GOP feels a need to address this pressing and overwhelming 'non-existing state problem' of lots of voters and a statistically non-existing voter fraud of less than 100th of a percent! The GOP propose to protect Minnesotans against this 'non-existing problem' by spending more of our tax dollars. They want to mandate voter IDs while adding ID machines to every vote location. Really?! What state are they living in? Has Minnesota become California? Where's the common sense in this kind of worthless legislation? What's not to love here...spending tax dollars on imaginary problems. Our State budget is in need of balancing with a projected 6 billion dollar deficit, jobs need to be created and issues like the state's transportation, education and health care need have funding, but the Minnesota GOP want to mandate spending solutions for non-existing problems. Really?! What's next on their agenda? 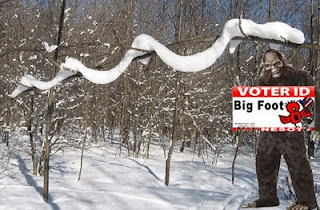 Will the Minnesota GOP address the nonexisting Snow Snakes and Bigfoot? Perhaps we'll get lucky and they will talk about killer mosquitoes. Has the minus degree frigid Minnesota weather finally turned the Minnesota GOP officially into insane fluffy pink elephants unable to address the REAL problems facing our state? Unfortunately, if they get their way, taxpayers get the bill for their insanity of fixing what isn't broke while women will continue to reap 24% less then men...ADDRESS THE REAL PROBLEMS!!! While cutting taxes for big corporations and trying to impose government ID's on Minnesota's voters (wonder who's paying for that? ), the GOP has been too busy to answer question regarding their own offered up slash and burn budget for partially balancing Minnesota's state budget; Wonder why that is? They won't even answer questions about their own budget...shameful but not surprising. Sen. Ted Daley (MN-R-38) facebook page said he" Toured the Delta Airlines facility yesterday to learn more about how we can attract, retain and grow jobs here in Minnesota "...wonder when he's going to tour the Lockheed Martin campus in his own district and discuss the 1000+ jobs going away! Remember the campaign promises from the newly elected Minnesotan Republican representatives? Apparently many of them have already forgotten those campaign pledges or an open and translucent government by the people including public debate. 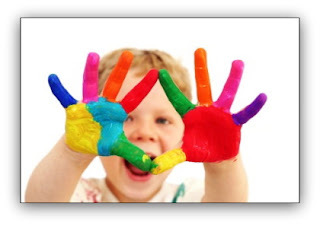 What we have seen is the GOP making cuts at any expense including those of the Child Protection Agency without any public input. Again, the Minnesota Republicans are using the 'whack a mole' cutting edge decision process (sigh!) and thereby not asking for debate which would bring to light some of the effects of their outrageous decisions. When elected officials have no values but money and no morals but power, Minnesotans can expect their quality of life to suffer, their families to pay, and their children to be at risk. This is the Minnesota GOP. Thier decision to cut the budget will impact the lives of Minnesota children that will last a lifetime. All children should to be protected and feel safe but not anymore in Minnesota. All I want to do is dance...see ya at the State CC tomorrow! The Minnesota Chamber of Commerce would have you believe that women being paid equally is both an 'outdated' and 'unnecessary' thing? Hmm...so it's okay to pay women 67 cents for every dollar paid to men doing the same job with the same experiences and background? ...Think again sexist jerks! What is outdated is the belief that without laws women won't continue to be discriminated against in the wage earning market place. When the first federal law was enacted on wage equity, women earned just 59% of the wages men earned. That disparity has improved over the years (decades) to around 80% but there still a ways to go. Follow this link to see women's earnings over the years compared to men's earnings. Census statistics from September 16, 2010 show that the women still earn 77 percent of what men earn, based on the median earnings of full-time, year-round workers in 2009. Both men's and women's earnings showed slight increases from 2008 to 2009, with men's at $47,127 and women's at $36,278, a difference of $10,849, a marked differences. So tell me again why we don't need the law? Yes women have made progress in the workforce but that is because of the laws. The fact remains that decades later, the goal of equal pay has still not been realized. In the last year, women in 20 states have actually seen the wage gap widen! Factor in that 40 percent of women working are the primary earners for their families, and we see more and more women slipping into the working poor. The need is even greater today to ensure that women are protected by fair and equitable earnings. 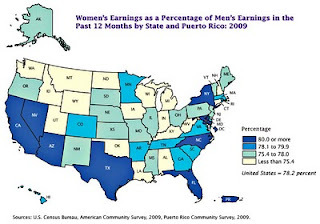 The map below shows how each state fares when it comes to gender equality in wages. The Minnesota Chamber of Commerce position on this issue shows a total disregard for the facts regarding pay inequity as well as the welfare of Minnesota families.